I had a pretty low key weekend, working all day Saturday and doing errands on Sunday. While out and about around town, I was amazed by the Chinese resilience. Who else would transport items like this? At the red light, I looked to my right, and saw a HUGE tree down in the road. I thought, "wow, must have been from a big storm". Then the light turned green, and the tree started to move! I then realized it was being transported on the back of a truck! This picture does not do it justice, but it truly was a sight to see. Then you have this guy... Trying to strap a dresser and drawers to his scooter, while his wife directed the operation. The mission was successful.. he got the dresser on, left the wife behind, and moved the scooter forward by pushing his feet on the ground like Fred Flinstone. ..Probably all the way back to Puxi! My dog, Mr. Snuggles.. always trying to find a warm spot in the cold apartment! One of the nicer things about living in China, specifically Jinqiao.. there are flower vendors outside of Carrefour who have really beautiful flowers that you normally only see in the spring, like these tulips, for about 3usd. I treat myself often..heehee ;) I'll take nature however I can get it! That being said, I think I'm turning into a plant lady, which I'm hoping is not as bad as being a stereotypical cat lady! PS Now that all of the Christmas decorations have been put away, I have my Spanish stuff out again.. 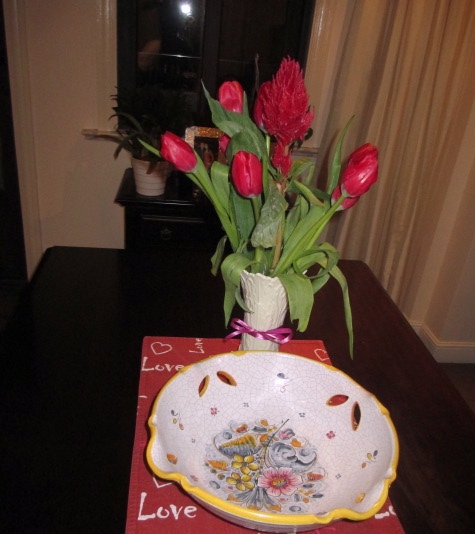 I love this bowl that I bought in Madrid last year! Ayy! yo echo mucho de menos España!! On Saturday I spent my day supervising my cheer team at the SISAC basketball tournament. We had a fun time cheering for the girls and boys varsity teams, and seeing the cheer team from SCIS perform. Saturday night I got ripped off by this guy. Let me explain how.. 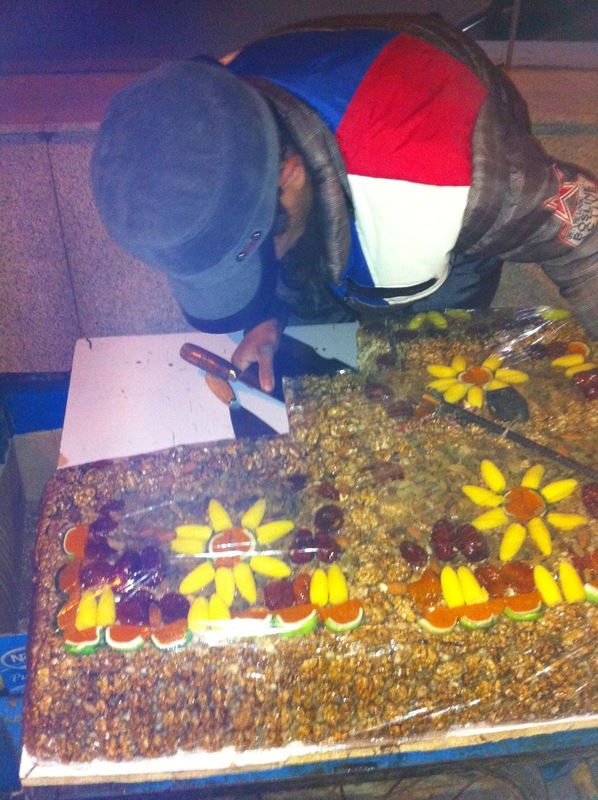 So naturally I stopped to admire the fruit decorations, and then he offered me a piece of whatever this is called. It sort of tasted like turrón, so let's just call it Chinese turrón. Well I miss Spain a lot, so I said okay, let me get a little-it's on the street, can't be that much. WELL... I didn't realize that the Chinese turrón was so heavy, nor the piece the man cut for me was going to be so deep that he tried to charge me 115rmb, which is 18usd! WHAT?!?!? no way! So I started to walk away to continue on to the metro, but he jumped in front of me, and wouldn't let me leave until I took the Chinese turrón and gave him some money. I told him I didn't want it and that it was too much. I offered 50rmb, just to get him away, but he wouldn't budge. Then he said 70rmb and took some of the pieces out of the bag. At this point, he totally ruined my joy of finding turrón in China, and I just wanted to be done with the bad experience. So I gave him my money and continued on my way. Later on, as I was squished up against the door with the sea of people surrounding me, I ate some turrón on the metro while thinking "man, do I need to start a TV show about being pranked in China". Sunday morning I made this oatmeal.. It came out pretty good, if I say so myself! 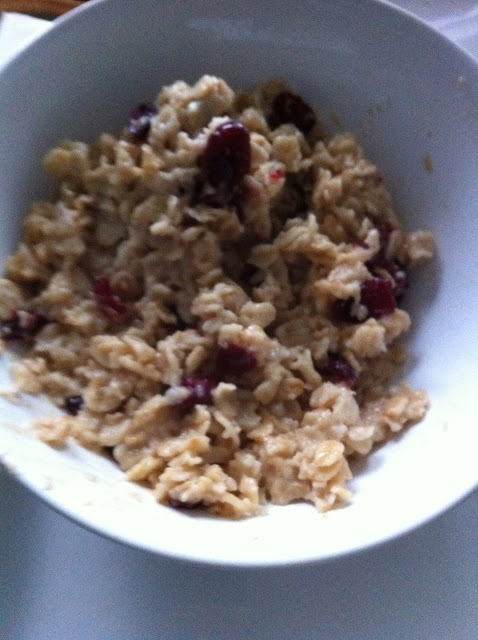 Oats, peanut butter, touch of sugar and crasins that I brought back from the States. I played Scrabble for the first time since HS.. we played it all the time in AP English once the big test was done, and we had a few weeks to enjoy before summer break. I won with 336 points, thankyouverymuch. There's only two spots we bluffed the rules a little bit, but when the only tiles you have are 4 "i"s a Q, and a Z, it's kinda hard not to! Last but certainly not least, check out this Mercedes parked outside my apartment. Apart from the lady decal, sparkles, pink color, and yellow wheels, I love the fluffy wheel cover. This car ranks right along side my other neighbor's car with a huge wing decal that says "Angle" instead of angel! More funny stories about expat life in Jinqiao to follow.. For now, have a happy and healthy week!